This article first published in the Journal of International Affairs (Columbia University), Vol. 52, no. 1 (Fall 1998). anticipates many of the changes in the global economy which have occurred in recent years including the impoverishment and thirdworldization of the developed countries. The text of this article was posted on globalresearch.ca in January 2002 with the following introductory note which addresses the economic crisis at the outset of the post 911 era. The onslaught of America’s war is occurring at the height of a global economic depression marked by the downfall of State institutions, mounting unemployment, the collapse in living standards in all major regions of the World, including Western Europe and North America and the outbreak of famines over large areas. This depression is far more serious than that of the 1930s. Moreover, the war has not only unleashed a massive shift out of civilian economic activities into the military-industrial complex, it has also accelerated the demise of the Welfare State in most Western countries. War and globalisation are intimately related processes. The global economic crisis (which preceded the events of September 11) has its roots in the New World Order “free market” reforms. Since the 1997 “Asian crisis”, financial markets have plummeted, national economies have collapsed one after the other, entire countries (e.g. Argentina and Turkey) have been taken over by their international creditors precipitating millions of people into abysmal poverty. “The post-September 11 crisis” in many regards announces both the demise of Western social democracy as well as the end on an era. The legitimacy of the global “free market” system has been reinforced, opening the door to a renewed wave of deregulation and privatisation, which could eventually result in the corporate take-over of all public services and State infrastructure (including electricity, municipal water and sewerage, inter-city highways, etc.). Moreover, in the US and Great Britain, but also in most countries of the European Union, the legal fabric of Western societies has also been overhauled. Based on the repeal of the rule of law, the foundations of an Authoritarian State apparatus have emerged with little or no organised opposition from the mainstay of civil society. Without debate or discussion, “the war on terrorism” against so-called “rogue states” is deemed necessary to “protect democracy” and enhance domestic security. A collective understanding of the war based on history, has been replaced by the need to “combat evil” and “hunt down Osama”. These “buzz-words” are part of a carefully designed propaganda campaign. The ideology of the “rogue state” developed by the Pentagon during the 1991 Gulf war, constitutes a new legitimacy, a justification for waging a “humanitarian war” against countries which do not conform to the New World Order and the tenets of the “free market” system. While a worldwide economic depression looms, Washington, Wall Street and the Western media point in chorus to a “cyclical downturn” attributable to “market uncertainties” resulting from the September 11th terrorist attacks. This article first published in 1998 in the Journal of International Affairs, examines the inner causes of the global depression. 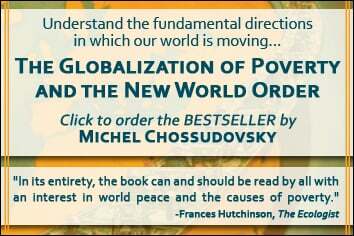 Part of this analysis is also contained in my book, The Globalization of Poverty and ther New World Order, Second Edition, Global Research, Montreal, 2003. The late 20th century will go down in world history as a period of global impoverishment marked by the collapse of productive systems in the developing world, the demise of national institutions and the disintegration of health and education programs. This “globalization of poverty”–which has largely reversed the achievements of post-war decolonization–was initiated in the Third World coinciding with the onslaught of the debt crisis. Since the 1990s, it has extended its grip to all major regions of the world including North America, Western Europe, the countries of the former Soviet block and the Newly Industrialized Countries (NICs) of South East Asia and the Far East. In the post-independence period extending through the 1980s, starvation deaths in South Asia had largely been limited to peripheral tribal areas. But in India today, there are indications of widespread impoverishment among both the rural and urban populations following the adoption of the 1991 New Economic Policy under the stewardship of the Bretton Woods institutions. More than 70 percent of rural households in India are small marginal farmers or landless farm workers, representing a population of over 400 million people. In irrigated areas, agricultural workers are employed for 200 days a year and in rain-fed farming for approximately 100 days. The phasing out of fertilizer subsidies–an explicit condition of the International Monetary Fund (IMF) agreement–and the increase in the prices of farm inputs and fuel is pushing a large number of small- and medium-sized farmers into bankruptcy. When assessing the impact on earnings, employment and social services, the post-Cold War economic collapse in parts of eastern Europe appears to be far deeper and more destructive than that of the Great Depression. In the former Soviet Union (starting in early 1992), hyperinflation triggered by the downfall of the ruble contributed to rapidly eroding real earnings. Economic “shock therapy” combined with the privatization program precipitated entire industries into immediate liquidation, leading to lay-offs of millions of workers. While the cost of living in eastern Europe and the Balkans was shooting up to western levels as a result of the deregulation of commodity markets, monthly minimum earnings were as low as ten dollars a month. “In Bulgaria, the World Bank and the Ministry of Labor and Social Assistance separately estimated that 90 percent of Bulgarians are living below the poverty threshold of U.S.$4 a day.”(9) Old age pensions in 1997 were worth two dollars a month,(10) Unable to pay for electricity, water and transportation, population groups throughout the region have been brutally marginalized from the modern era. With the breakdown of the welfare state, high levels of youth unemployment are increasingly the source of social strife and civil dissent. In the United States, political figures decry the rise of youth violence, promising tougher sanctions without addressing the roots of the problem. Economic restructuring has transformed urban life, contributing to the “thirdworldization” of western cities. The environment of major metropolitan areas is marked by social apartheid: urban landscapes have become increasingly compartmentalized along social and ethnic lines. Poverty indicators such as infant mortality, unemployment and homelessness in the ghettos of American (and increasingly European) cities are in many respects comparable to those prevailing in the Third World. More recently, speculative movements against national currencies have contributed to the destabilization of some of the world’s more successful “newly industrialized” economies (Indonesia, Thailand, Korea), leading virtually overnight to abrupt declines in the standard of living. In the 1997 Asian currency crisis, billions of dollars of official central bank reserves were appropriated by institutional speculators. In other words, these countries are no longer able to “finance economic development” through the use of monetary policy. This depletion of official reserves is part and parcel of the process of economic restructuring leading to bankruptcy and mass unemployment. In other words, privately held capital in the hands of “institutional speculators” far exceeds the limited reserves of Asian central banks. The latter acting individually or collectively are no longer able to fight the tide of speculative activity. The world economy is said to be booming under the impetus of “free market” reforms. Without debate or discussion, so-called “sound macroeconomic policies” (meaning the gamut of budgetary austerity, deregulation, downsizing and privatization) are heralded as the key to economic success. In turn, both the World Bank and the United Nations Development Programme (UNDP) assert that economic growth in the late 20th century has contributed to a remarkable reduction in the levels of world poverty. The entire framework built on the one dollar a day assumption is tautological; it is totally removed from an examination of real life situations. No need to analyze household expenditures on food, shelter and social services; no need to observe concrete conditions in impoverished villages or urban slums. In the World Bank framework, the “estimation” of poverty indicators has become a numerical exercise. Conversely, if the U.S. Bureau of Census methodology (based on the cost of meeting a minimum diet) were applied to the developing countries, the overwhelming majority of the population would be categorized as “poor.” While this exercise of using “Western standards” and definitions has not been applied in a systematic fashion, it should be noted that with the deregulation of commodity markets, retail prices of essential consumer goods are not appreciably lower than in the United States or Western Europe. The cost of living in many Third World cities is higher than in the United States. Moreover, household budget surveys for several Latin American countries suggest that at least 60 percent of the population in the region does not meet minimum calorie and protein requirements. In Peru, for instance, according to household census data, 83 percent of the Peruvian population was unable to meet minimum daily calorie and protein requirements following the 1990 IMF sponsored “Fujishock.”(25) The prevailing situation in Sub-Saharan Africa and South Asia is more serious, where a majority of the population suffers from chronic undernourishment. Declining levels of poverty including forecasts of future trends are derived with a view to vindicating free market policies and upholding the “Washington Consensus” on macroeconomic reform. The “free market” system is presented as the most effective means of achieving poverty alleviation, while the negative impact of macroeconomic reform is denied. Both institutions point to the benefits of the technological revolution and the contributions of foreign investment and trade liberalization, without identifying how these global trends might exacerbate rather than abate poverty. National labor markets are no longer segregated: workers in different countries are brought into overt competition with one another. Workers’ rights are derogated as labor markets are deregulated. World unemployment operates as a lever which “regulates” labor costs at a world level. Abundant supplies of cheap labor in the Third World (e.g. China with an estimated 200 million surplus workers) and the former Eastern block contribute to depressing wages in developed countries. Virtually all categories of the labor force (including the highly qualified, professional and scientific workers) are affected, even as competition for jobs encourages social divisions based on class, ethnicity, gender and age. While mainstream economics stresses efficient allocation of society’s scarce resources, harsh social realities call into question the consequences of this means of allocation. Industrial plants are closed down, small and medium-sized enterprises are driven into bankruptcy, professional workers and civil servants are laid off and human and physical capital stand idle in the name of “efficiency.” The drive toward an “efficient” use of society’s resources at the microeconomic level leads to exactly the opposite situation at the macroeconomic level. Resources are not used “efficiently” when there remain large amounts of unused industrial capacity and millions of unemployed workers. Modern capitalism appears totally incapable of mobilizing these untapped human and material resources. This global economic restructuring promotes stagnation in the supply of necessary goods and services while redirecting resources toward lucrative investments in the luxury goods economy. Moreover, with the drying up of capital formation in productive activities, profit is sought in increasingly speculative and fraudulent transactions, which in turn tend to promote disruptions on the world’s major financial markets. The expansion of output in this system takes place by “minimizing employment” and compressing workers’ wages. This process in turn backlashes on the levels of consumer demand for necessary goods and services: unlimited capacity to produce, limited capacity to consume. In a global cheap labor economy, the very process of expanding output (through downsizing, layoffs and low wages) contributes to compressing society’s capacity to consume. The tendency is therefore toward overproduction on an unprecedented scale. In other words, expansion in this system can only take place through the concurrent disengagement of idle productive capacity, namely through the bankruptcy and liquidation of “surplus enterprises.” The latter are closed down in favor of the most advanced mechanized production. Entire branches of industry stand idle, the economy of entire regions is affected and only a part of the world’s agricultural potential is utilized. This global oversupply of commodities is a direct consequence of the decline in purchasing power and rising levels of poverty Oversupply contributes in turn to the further depression of the earnings of the direct producers through the closure of excess productive capacity. Contrary to Say’s Law of Markets, heralded by mainstream economics, supply does not create its own demand. Since the early 1980s, overproduction of commodities leading to plummeting (real) commodity prices has wreaked havoc, particularly among Third World primary producers, but also (more recently) in the area of manufacturing. Against a background of economic stagnation (including negative growth rates recorded in Eastern Europe, the former Soviet Union and sub-Saharan Africa), the world’s largest corporations have experienced unprecedented growth and expansion of their share of the global market. This process, however, has largely taken place through the displacement of preexisting productive systems, i.e. at the expense of local-level, regional and national producers. Expansion and profitability for the world’s largest corporations is predicated on a global contraction of purchasing power and the impoverishment of large sectors of the world population. Survival of the fittest: the enterprises with the most advanced technologies or those with command over the lowest wages survive in a world economy marked by overproduction. While the spirit of Anglo-Saxon liberalism is committed to “fostering competition,” G-7 macroeconomic policy (through tight fiscal and monetary controls) has in practice supported a wave of corporate mergers and acquisitions as well as the bankruptcy of small- and medium-sized enterprises. In turn, large multinational companies (particularly in the US and Canada) have taken control of local-level markets (particularly in the service economy) through the system of corporate franchising. This process enables large corporate capital (“the franchiser”) to gain control over human capital, cheap labor and entrepreneurship. A large share of the earnings of small firms and/or retailers is thereby appropriated, while the bulk of investment outlays is assumed by the independent producer (the “franchisee”). A parallel process can be observed in Western Europe. With the Maastricht Treaty, the process of political restructuring in the European Union increasingly heeds to dominant financial interests at the expense of the unity of European societies. In this system, state power has deliberately sanctioned the progress of private monopolies: large capital destroys small capital in all its forms. With the drive toward the formation of economic blocks both in Europe and North America, the regional- and local-level entrepreneur is uprooted, city life is transformed, individual small scale ownership is wiped out. “Free trade” and economic integration provide greater mobility to the global enterprise while at the same time suppressing (through non-tariff and institutional barriers) the movement of small local-level capital. (35) “Economic integration” (under the dominion of the global enterprise), while displaying a semblance of political unity, often promotes factionalism and social strife between and within national societies. The restructuring of the global economic system has evolved through several distinct periods since the collapse of the Bretton Woods system of fixed exchange rates in 1971. Patterns of oversupply started to unfold in primary commodity markets in the second part of the 1970s, following the end of the Vietnam War. The debt crisis of the early 1980s was marked by the simultaneous collapse of commodity prices and the rise of real interest rates. The balance of payments of developing countries was in crisis, and the accumulation of large external debts provided international creditors and “donors” with “political leverage” to influence the direction of country-level macroeconomic policy. Contrary to the spirit of the Bretton Woods agreement of 1944, which was predicated on “economic reconstruction” and stability of major exchange rates, the structural adjustment program (SAP) has, since the early 1980s, largely contributed to destabilizing national currencies and ruining the economies of developing countries. The restructuring of the world economy under the guidance of the Washington-based international financial institutions and the World Trade Organization (WTO) increasingly denies individual developing countries the possibility of building a national economy. The internationalization of macroeconomic policy transforms countries into open economic territories and national economies into “reserves” of cheap labor and natural resources. The state apparatus is undermined, industry for the internal market is destroyed, national enterprises are pushed into bankruptcy These reforms have also been conducive to the elimination of minimum wage legislation, the repeal of social programs and a general diminution of the state’s role in fighting poverty. The inauguration of the WTO in 1995 marks a new phase in the evolution of the post war economic system. A new “triangular division of authority” among the IMF, the World Bank and the WTO has unfolded. The IMF has called for more effective “surveillance” of developing countries’ economic policies and increased coordination among the three international bodies, signifying a further infringement on the sovereignty of national governments. Under the new trade order (which emerged from the completion of the Uruguay Round at Marrakesh in 1994), the relationship of the Washington-based institutions to national governments is to be redefined. Enforcement of IMF-World Bank policy prescriptions will no longer hinge upon ad hoc country-level loan agreements (which are not “legally binding” documents). Henceforth, many of the mainstays of the structural adjustment program (e.g. trade liberalization and the foreign investment regime) have been permanently entrenched in the articles of agreement of the WTO. These articles set the foundations for “policing” countries (and enforcing “conditionalities”) according to international law. Ironically, the ideology of the “free” market upholds a new form of state interventionism predicated on the deliberate manipulation of market forces. Moreover, the development of global institutions has led to the development of “entrenched rights” for global corporations and financial institutions. The process of enforcing these international agreements at national and international levels invariably bypasses the democratic process. Beneath the rhetoric of so-called “governance” and the “free market,” neoliberalism provides a shaky legitimacy to those in the seat of political power. The manipulation of the figures on global poverty prevents national societies from understanding the consequences of a historical process initiated in the early 1980s with the onslaught of the debt crisis. This false consciousness has invaded all spheres of critical debate and discussion on the “free” market reforms. In turn, the intellectual myopia of mainstream economics prevents an understanding of the actual workings of global capitalism and its destructive impact on the livelihood of millions of people. International institutions including the United Nations follow suit, upholding the dominant economic discourse with little assessment of how economic restructuring backlashes on national societies, leading to the collapse of institutions and the escalation of social conflict. (1) See Food and Agricultural Organization of the United Nations, Food Supply Situation and Crop Prospects in Sub-Saharan Africa, Special Report, no. 1 (April 1993). While there are no data at a regional level, one can infer from country-level figures that at least a quarter of Sub-Saharan Africa’s population is at risk of famine. Ten million peasants in the Sertao region of Northeast Brazil suffer from famine and lack of water according to official figures. See “Dix millions de paysans ont faim et soif,” Devoir, 16 April 1993, p. B5. (2) For further details see Claire Brisset, “Risque de famine sans precedent en Afrique,” Monde Diplomatique (July 1992) pp. 24-25, and Claire Brisset, “Famines et guerres en Afrique subsaharienne,” Monde Diplomatique (June 1991) pp. 8-9. (3) K. Nagaraj, et al., “Starvation Deaths in Andhra Pradesh,” Frontline, 6 December 1991, p. 48. (9) Jonathan C. Randal, “Reform Coalition Wins Bulgarian Parliament,” Washington Post, 20 April 1997, p. A21. (10) “The Wind in the Balkans,” Economist, 8 February 1997, p. 12. (11) Eric Ekholm, “On the Road to Capitalism, China Hits a Nasty Curve: Joblessness,” New York Times, 20 January, 1998. (13) “Let Good Times Roll,” Financial Tines, 1 January 1995 (editorial commenting on OECD economic forecasts), p. 6. (19) ibid., p. 5. Introduced in the 1997 Human Development Report, the human poverty index (HPI) attempts “to bring together in a composite index the different features of deprivation in the quality of life to arrive at an aggregate judgement on the extent of poverty in a community.” A high HPI indicates a high level of deprivation. See http://www.undp.org/undp/hdro/anatools.htm#3. (20) Soren Ambrose, “The IMF Has Gotten Too Big for Its Riches,” Washington Post, 26 April 1998, p. C2. (21) See Clement Trudel, “Le Mexique subit le choc de l’internationalization,” Devoir, 28 March 1998, p. A4. (24) According to the official definition of Statistics Canada (1995). For country ranks based on the UNDP’s Human Development Index, see United Nations Development Programme (1997) table 6, p. 161. (28) See Saulma Chaudhuri and Pratima Paul Majumder, The Conditions of Garment Workers in Bangladesh, An Appraisal (Dhaka: Bangladesh Institute of Development Studies, 1991). According to this study, monthly wages in the garment industry were on the order of U.S.$20 a month (including overtime) in 1992–less than ten cents an hour. (29) “International Billionaires, the World’s Richest People,” Forbes Magazine, 28 July 1997. (30) Charles Laurence, “Wall Street Warriors Force their Way into the Billionaires Club,” Daily Telegraph, 30 September 1997. (31) “Increased Demand Transforms Markets,” Financial Times, 21 June 1995, p. II. (32) “Global Investment Soars,” Financial Times, 7 June 1996, p. III. (33) See Peter Bosshard, “Cracking the Swiss Banks,” Multinational Monitor, November 1992. (34) Based on the author’s research and interviews in Tunisia and Kenya, December 1992.